The XS4 ‘DIN’ glass door lock has been specially designed for use with DIN 18101 standard glass doors. Its steel body is stylish and modern and its unique ‘sandwich body’ construction makes it easy to install – without having to replace the door. 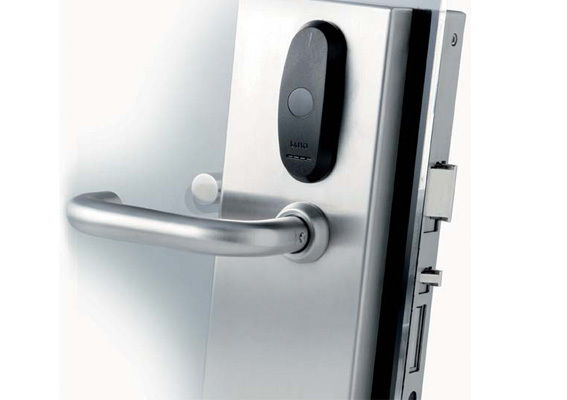 A ‘wireless’ version of the XS4 ‘DIN’ glass door lock is also available for real-time access control requirements. Clutch mechanism escutcheon when unlocked handle moves free. ID technologies available: i-Button, DESFire, DESFire EV1, Mifare, Mifare plus, Mifare Ultralight C, Inside Picopass, LEGIC Prime, LEGIC Advant, HID iClass, SKIDATA. Available in wireless version for wireless real-time control. Dimensions: 296mm x 98.5mm x 20mm. Glass door compatibility: Din 18101 standard. Automatic lock, the auxiliary latch (anticard) projects and deadlocks the deadbolt. Inside always allows free egress (anti panic function). Sandwich body design for easy installation. High security through advanced hardened high resistance anti-drill plates. Counter strike available for glass to glass doors.